Forget the “mom guesses the name of Smash Bros characters” memes. Smash Bros. dads are coming out of the woodwork, and they’re improving Smash Bros. in their own special ways, too. 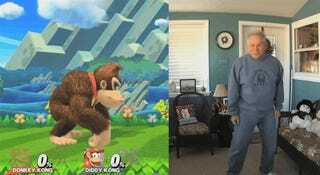 Nick Luciano somehow convinced his dad to do a bunch of the Smash Bros. taunts in real life, and the results are hilarious. He was a a good sport about it too—the roster is pretty big! I’m particularly fond of his interpretation of Captain Falcon. I wanna see a Smash Bros. dad electric knee.